Apple cider (left) is an unfiltered, unsweetened apple juice. 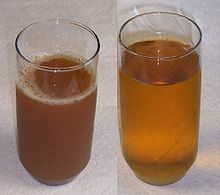 Most present-day apple juice is pasteurized and filtered (right). Apple cider (also called sweet cider or soft cider or simply cider) is the name used in the United States and parts of Canada for an unfiltered, unsweetened, non-alcoholic beverage made from apples. Though typically referred to simply as "cider" in those areas, it is not to be confused with the alcoholic beverage known as cider throughout most of the world, called hard cider in the US. It is the liquid extracted from an apple and all its components, that is then boiled to concentration. The liquid can be extracted from the apple itself, the apple core, the trimmings from apples, or apple culls. Once pressed mainly at farmsteads and local mills, apple cider is easy and inexpensive to make. It is typically opaque due to fine apple particles in suspension and generally tangier than commercial filtered apple juice, but this depends on the variety of apples used. Cider is typically pasteurized to kill bacteria and extend its shelf life, but untreated cider is common. In either form, apple cider is seasonally produced in autumn. It is traditionally served on the Halloween, Thanksgiving, Christmas, and various New Year's Eve holidays, sometimes heated and mulled. While some states specify a difference between apple juice and cider, the distinction is not well established across the U.S.  Massachusetts makes an attempt to at least differentiate fresh cider and processed apple juice: according to its Department of Agricultural Resources, "apple juice and apple cider are both fruit beverages made from apples, but there is a difference between the two. Fresh cider is raw apple juice that has not undergone a filtration process to remove coarse particles of pulp or sediment. Apple juice is juice that has been filtered to remove solids and pasteurized so that it will stay fresh longer. Vacuum sealing and additional filtering extend the shelf life of the juice." This still leaves unfiltered apple juice that is no longer raw in a gray area, presumably cider but not labeled as such. The addition of sweeteners or reconstitution from concentrate are left even grayer. Historically all cider was left in its natural state, unprocessed. 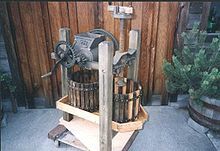 In time, airborne yeasts present on apple skins or cider making machinery would start fermentation in the finished cider. Left on its own, alcohol would develop and forestall growth of harmful bacteria. When modern refrigeration emerged, cider and other fruit juices could be kept cold for long periods of time, retarding fermentation. Any interruption of the refrigeration, however, could allow bacterial contamination to grow. Outbreaks of illness resulted in government regulation requiring virtually all commercially produced cider to be treated either with heat or radiation. Many commercially produced ciders are pasteurized which extends its shelf life; the most common method used is pasteurization,  but UV irradiation  is also employed. 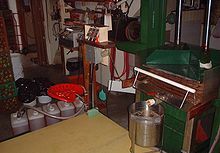 Pasteurization, which partially cooks the juice, results in some change of the sweetness, body and flavor of the cider;  irradiation has less noticeable effects. Modern cider making has come a long way from early forms of production that involved a man- or horse-powered crusher. 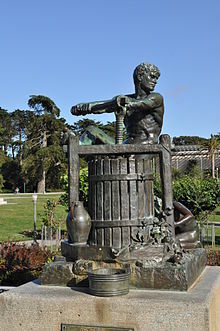 These consisted of a stone or wood trough with a heavy circulating wheel to crush the fruit, and a large manual screw press to express the juice from the pulp. Straw was commonly used to contain the pulp during pressing, later replaced by coarse cloth. The Palmer Bros. Company, of Cos Cob, CT, made the most popular "modern" rack and cloth press from the mid 1800s to the mid 1900s, when production shifted to OESCO in Massachusetts. As technology advanced, rotary drum "scratters"[ clarification needed] came into use. Today, nearly all small pressing operations use electric-hydraulic equipment with press cloths and plastic racks in what is commonly called a "rack and cloth press", and electric hammermill "breakers". Depending on the varieties of apples and using the optimal extraction methods, it takes about one third of a bushel (10 liters) to make a gallon (3.78 liters) of cider. Apples are washed, cut, and ground into a mash that has the consistency of coarse applesauce. 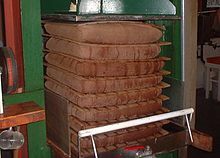 Layers of this mash are then either wrapped in cloth and placed upon wooden or plastic racks where a hydraulic press then squeezes the layers together, or the mash is distributed onto a continuous belt filter press,  which squeezes the pulp between two permeable belts fed between a succession of rollers that press the juice out of the pulp in a continuous, highly efficient operation. The resulting juice is then stored in refrigerated tanks, pasteurized to kill bacteria and extend shelf life, and bottled and sold as apple cider. The juice may also be fermented to produce hard cider, which then may be further treated by exposure to acetobacter to produce apple cider vinegar, or distilled to produce apple brandy. The waste left after pressing, known as pomace, is sold for cattle feed. 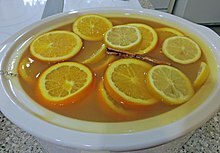 Hot mulled cider, similar to " Wassail", is a popular autumn and winter beverage. Cider is heated to a temperature just below boiling, with cinnamon, orange peel, nutmeg, cloves, or other spices added. ^ "Where Are You From?". Credoreference.com. Retrieved 2015-05-09. ^ "Effects of climate on character". Aeppeltreow.com. Archived from the original on 2012-03-14. Retrieved 2015-05-09. ^ Fabricant, Florence (1990-10-31). "Apple Cider: It's the Drink For Tonight". The New York Times. Retrieved 2010-04-25. ^ "What's the difference between apple juice and apple cider?". Straigbhtdope.com. Retrieved 2015-05-09. ^ a b "Massachusetts Department of Agricultural Resources". ^ a b "Unpasteurized fruit juices". Hc-sc.gov. Retrieved 2015-05-09. ^ "HACCP — "Hazard Analysis and Critical Control Point: Juice HACCP"". Fda.gov. Retrieved 2015-05-09. ^ Kaufman, Marjorie (1998-10-11). "New York Times, October 11, 1998 "Those Quaint Apple Cider Stands Meet Up With the Long Arm of the Law" Accessed: 15 October, 2007". The New York Times. Retrieved 2010-04-25. ^ "USDA Food Safety "New Juice Regulations Underway"" (PDF). ^ "Canadian Food Insp. Agency on Unpasteurized Fruit Juice/Cider Products". Hc-sc.ca. Retrieved 2015-05-09. ^ "Federal Register: January 19, 2001, HHS/FDA "21 CFR Part 120 Final Rule"". Archived from the original on December 13, 2007. ^ "Log reduction explained". Archived from the original on March 26, 2008. ^ "Core Equipment Belt Presses for the apple Juice, cider and winemaking industries". Core-equip.com. Retrieved 5 March 2014. ^ "Warm Up With Mulled Wine & Cider". Allrecipes.com. Retrieved 2015-05-09. ^ "'Orchard Alley' in Georgia". Georgia.org. Archived from the original on 2009-05-31. Retrieved 2015-05-09. ^ "Massachusetts agri-tourism guide". Mass.gov. Retrieved 2015-05-09. ^ "Orchard tourism in Canada". Mediacentre.canada.travel. Retrieved 2015-05-09. ^ "Official State Beverages". Netstate.com. Retrieved 2015-05-09.